Do we really have to buy it? In the fall of 1998 my parents drove up to Colorado from Phoenix, Arizona to co-sign on my house. At that time, I had never carried a credit card nor debt of any sort and therefore had no credit history. I was proud of this fact but the loan officer was just shaking his head, tapping the computer monitor screen as though the lack of data were incorrect, impossible. My parents arrived just hours before the signing. My mother stepped from the car to the sidewalk where my then girlfriend Janet (owner of the famous Yellow Dog “Potter”) and I greeted them. My mother stopped, looked at the house, at my father, and then to me. My stomach did one of those implosions as though someone invisible punched me. I had hoped for “You did well. Good choice,” or at least, “Well, it’ll take some work, but it will be a jewel in no time.” Rather, with tears in her eyes, her lips quivering as she fought back the words, “Do, do you really have to buy it? Maybe there is another one? [pause, looking around] Did you look in the rest of the neighborhood?” This, coming from a seasoned home remodeler was really not good. It was that bad, the worst house in the best, Old Town neighborhood. Nearly one hundred years later, the house has received two additions (once by a previous owner, as is evident in the attic by a second roof-line, and again by me). Now one must literally walk inside the houses of this area to recognize the similarities in the original floor plans. Within 48 hours of signing, Janet, my parents, and I filled a 40 cubic yard, roll-away dumpster with the things we removed, including a make-shift closet (keep in mind that closets were not an integral part of home design at this time), kitchen cabinets and counters, and cat-piss soaked, Brady Bunch orange carpet and particle board underlayment. Disgusting. The seven years that followed saw steady, but relatively slow progress as Colorado is conducive to outdoor activities nearly every weekend of the year. Given a choice, for those weeks I was not traveling for Terra Soft or for adventure, I would nine times out of ten choose rock climbing over scraping, rewiring, painting, or plumbing. Nonetheless, I filled a 40 cubic yard dumpster two more times, and a smaller version at least two times with the rubble of demolition and remodel. It has been a labor of love and hate as nothing can be more rewarding and completely debilitating than completely rebuilding an old house, inside and out. I have not by any means moved to restore this home to an historic condition, rather, I have worked to improve its function while reducing its energy footprint (long before “carbon offsets” was in the vernacular). 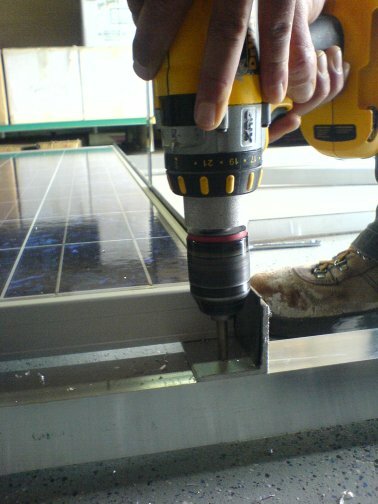 Each project had at some level an intent to improve the insulation and thermal properties of this otherwise black hole of residential energy consumption. 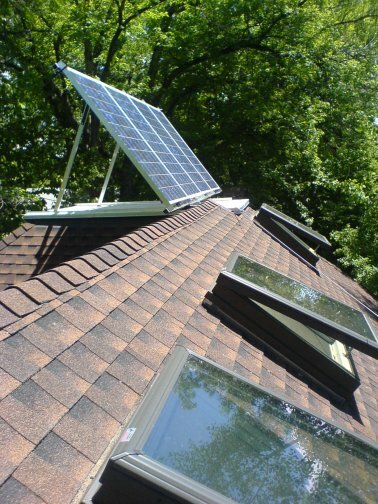 Now, in the summer of 2009, I do contend that my home is one of the most energy efficient in the neighborhood, especially for its age and humble beginning. • Original single-pane wood frame windows, most of which neither opened nor closed from whatever position they occupied. Enormous air gaps one could feel if seated on the opposite side of the room. • No insulation in the plaster-lath / pine ship-lap walls, for it had not yet been invented when built in 1913. • No sub-floor insulation beneath the tongue-grove fir. • Lowest Energy Star rating possible forced air furnace (I believe the owners installed it “new” just a year or two prior to selling; looks good on paper, a joke in reality). 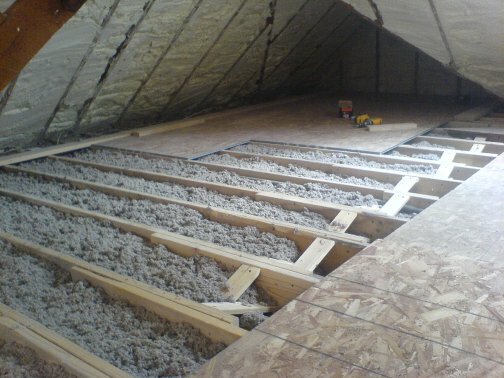 • 4-6″ rock wool and mouse droppings attic insulation, a seemingly 60/40 split between the two. • No insulation between the eaves nor over the soffits. • All original knob-n-tube wiring across the attic with splices into Romex as it came through the walls and into the breaker box. Fooled the inspector (or he just didn’t care) for the report clearly said, “All new wiring”. Fooled me too until I started crawling around in the attic a few years later, horrified at the mess. • Chaotic, scary disarray of an attempt at plumbing. • A guilty excuse for a traditional, tank water heater whose pilot light (when it was not put out by the leaking water) alone must have been ample energy to heat a half dozen gallons a day. • A wood burning stove rested on several hundred pounds of sandstone which were placed on 4 inches of concrete which was poured onto a piece of 3/4″ plywood which was, believe it or not, placed on top of the Brady Bunch orange carpet and cat-piss soaked backing (I kid you not). This assembly was so heavy (and ill designed) that the north side of the house slumped four inches over a twenty foot run! In the winter, the furnace would run nearly non-stop in an attempt to maintain just 60F degrees. At least eighty-five percent of the time on, the remaining down-time more likely due to sheer fatigue for trying so damn hard than the wall mounted thermometer giving permission to take fifteen. At the worst of it, having grown completely fed-up with the inefficiency and filth of forced air, I removed the furnace and duct work from beneath the house only to head out on another roadtrip for Terra Soft. When I returned, I had but one heat source in the entire house which was hard pressed to maintain 48F degrees by day and a low of 36 or 38 at night. On the other end of the house, despite an electric space heater, my feet literally froze to the bathroom floor as I brushed my teeth. A few years prior, perhaps just two or three after the house was purchased, my parents came to help me transform what was the primary entrance through a screened-in porch into a breakfast nook with the entire southern wall rebuilt in glass block. However, after two weeks effort, the porch was demolished but the new wall was not even started, a sheet of plastic stretched and stapled across the 15′ x 7′ span … for an entire year. I recall enjoying snow flurries in my kitchen, the neighbor’s cat on my couch when I cam home at night, and more than a normal supply of mice, unwanted but not altogether horrible guests for they remind me that mammals are capable of surviving in harsh extremes. This is not a description of my house alone, rather a typical, turn-of-the-last century home in Northern Colorado or anywhere in the Midwest where wall insulation had not yet been invented; electrical wiring, forced air, and plumbing were remodel projects done on the cheap by inexperienced home owners or friends who claim expertise demonstrated by their ownership of tools. • 1998-2005: Major remodel projects such as the installation of solid oak, tongue-n-grove floors, re-plumbing the entire house, expansion of the bathroom and simultaneous reduction of the number of doorways into the kitchen, construction of a poured concrete countertop rimmed by 13 layers of 1/16″ hand-laminated oak, installation of custom built oak cabinets and five bulk food bins, construction of an exterior entrance to the basement to replace the trapdoor in the kitchen floor, and all interior walls repainted (at least once, sometimes twice). • 2002: Planted 3 aspen trees on the south east corner of the house. • 2002-03: Replaced south wall of kitchen with glass block. 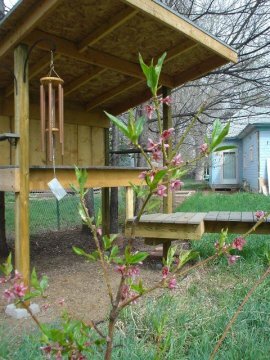 • 2004: Planted three additional aspen trees and a relatively fast growing, large bush (sorry, forgot the name) to provide shade from the afternoon sun by summer, and allow direct solar gain in winter. • 2006: Installed tankless water heater (which requires no pilot light) for on-demand, non-stop hot water. Seriously, why has all of Europe, Asia, Central and South America used these for decades and yet North America is just now considering them? 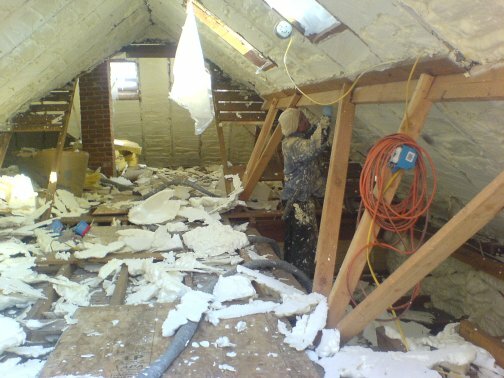 • 2006: Removed rock wool insulation from the attic. • 2006: Removed 3 layers asphalt shingles and 1 layer wood shakes, then resurfaced entire roof with plywood, Iceshield over the soffits, felt, and 50 year shingles. Fiddler Through the Roof provides a humorous side-story about this project. 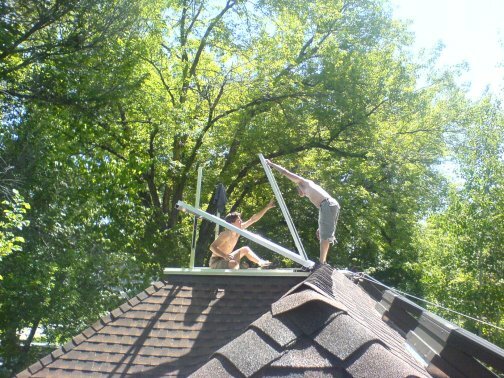 • 2006: Installed 4 double-pane, crank-open skylights which drastically cut thermal build-up during otherwise hot summer days. I have noticed a tremendous reduction in heat retention in the lower living quarters following the installation of these windows. 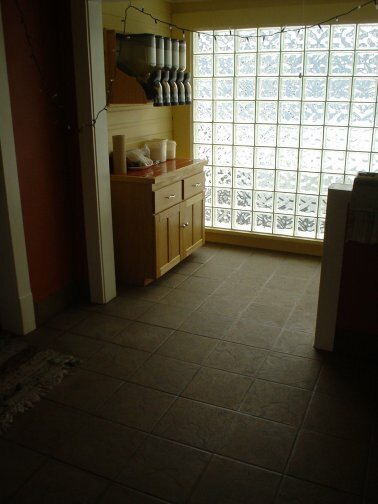 • 2006: Finished kitchen floor with ceramic tile to absorb heat in the winter, remain cool in the summer. (see photo of glass block, above). • 2006-08: Replaced forced air with heating unique to each room. Installed a natural gas stove for the living and dining rooms and den. Installed 220V electric space heaters (3 total), one each in the kitchen, bathroom, and new-addition workshop. The manufacturer recommended the coil + fan model as 15% more efficient than “hydronix” which is 10-14% more efficient than traditional baseboard “cal-rod” models. • 2006-09: Rewired entire house, top to bottom with an emphasis on electric circuit load balance, logical room organization, and ease of migration from grid-tied to inverter breaker box should the needs change. • 2007: Installed (only to remove a year and a half later) traditional fiberglass batting between the rafters in the attic, as detailed in the story Shot in the Back. 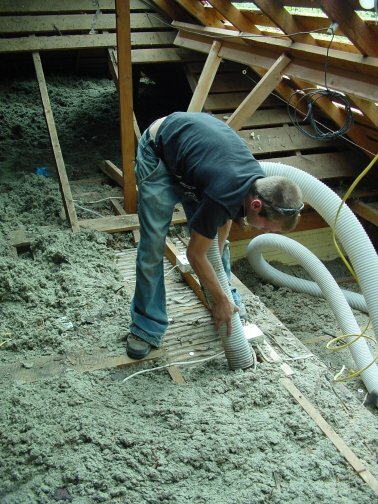 • 2007: Sprayed Icynene expansion foam beneath the kitchen, laundry, and bath floors as well as a “rim shot” to seal the small, unfinished basement (which now keeps the pipes from freezing even without heat tape). 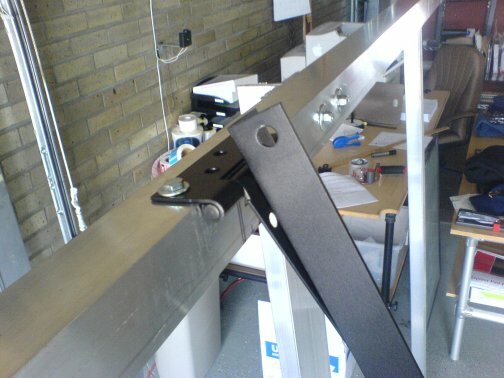 • 2007: Replaced all windows with double-pane, low-e glass in vinyl frames. Treat all edges of all windows, inside and out with silicon and where appropriate, new wood trim. • 2008-09: Replaced all entry doors with exterior grade, solid fir doors. 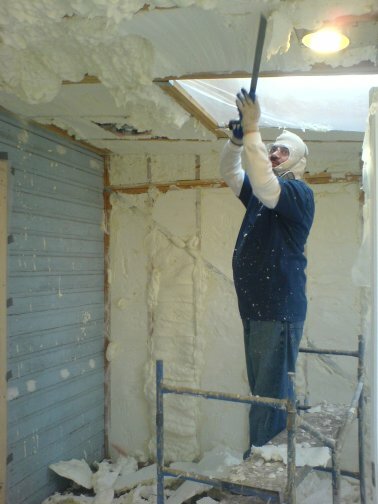 • 2008: Blew cellulose insulation (made from 100% post-consumer, finely shredded newspaper treated with a fire-retardant chemical) into the walls, a procedure which requires drilling a few hundred holes, one high and one low between each exterior wall stud, and then applying a vacuum hose with nozzle and high pressure air to force the insulation into every nook and cranny. Incredibly effective! 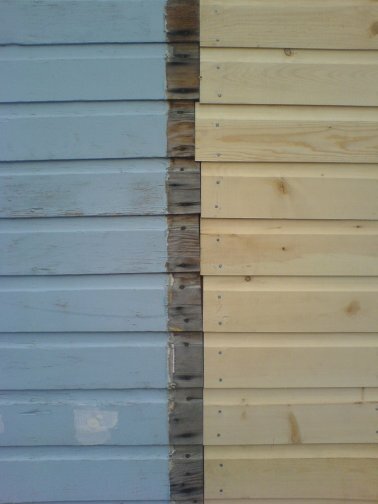 • 2008-09: Replaced both front and back doors with exterior grade, solid fir doors. This fall removing a 3rd door from the west wall, to be replaced with a circular window. 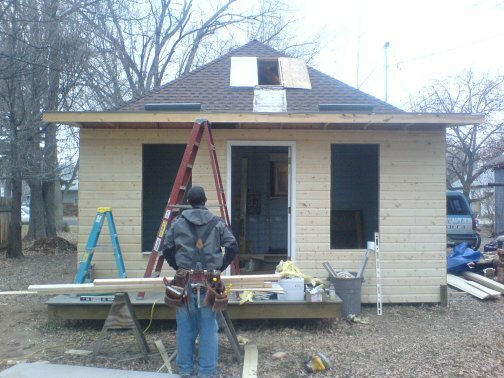 • 2008-09: Added 200 sq-ft addition (workshop) on west side incorporates an application of Icynene expansion foam between the 4″ stud walls and 10″ rafters for an audio, vapor, and radiant/convective barrier that is truly impressive — just 4″ foam provides the equivalent R value of 6-8″ fiberglass plus the added audio, vapor, and radiant barrier which fiberglass does not provide. The two hand-crank skylights coupled with the two double-pane, sliding windows provide for natural circulation in the summer months, a cooling tower effect which is highly effective. See “What was learned?” below for more information. 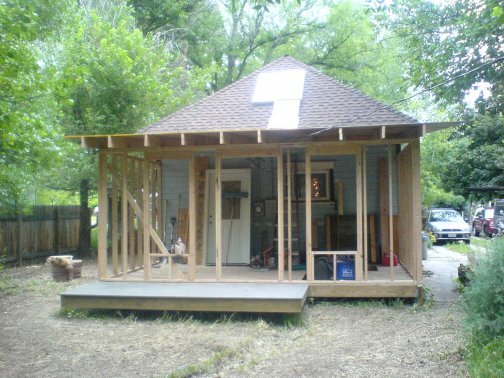 • 2009: Sprayed 4″ Icynene expansion foam insulation between all rafters in attic for an audio, vapor, and radiant/convective barrier; blew 6″ cellulose insulation between attic floor joists before the application of 3/4″, tongue-n-groove wafer board. • 2009: Installed a ceiling fan in the living room and dining room (each) to encourage efficiency through air circulation in both summer and winter. 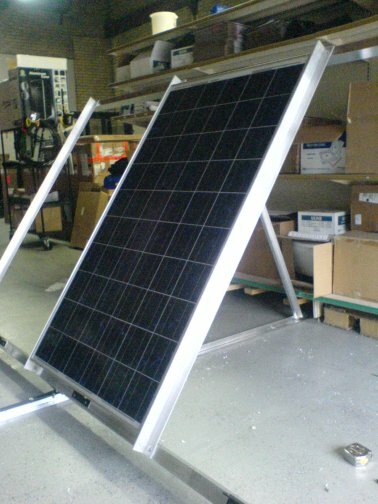 • 2009: Completed the design, fabrication, installation, and wiring of a rooftop 840 watt solar photovoltaic array, 300Ah battery backup, and grid-tied inverter which was on September 22 approved by the City of Loveland Electric Utility as the first battery-backed, grid-tied solar photovoltaic system in the district. It is far simpler, faster, and less frustrating to build a new house than remodel an old. But that is a lesson anyone who intentionally acquires an historic home already knows, and for some incurable reason repeats a few times in his or her life. Overall, it is possible to take a relative piece of s&*! and turn it into something quite nice, even energy efficient if you put enough thought and time and yes, some money into it (but far more time than money). • Insulation, insulation, insulation. It is the answer to just about every home heating and cooling issue. Insulation by its very definition is a means of blocking the movement of heat from one place to another. The more energy transfer is kept in check, the less energy your home requires to maintain the inside climate as you desire. Consider blown cellulose into existing walls or Icynene expansion foam for attic eaves and new construction. • Learn from the past. Returning to the methods of the 1800s, look again at room-to-room radiant heating, individually powered or supplied by a central boiler. It just makes good physics sense. A flame more effectively heats a liquid (water) or solid (metal) than it does a gas (air) as a liquid is far more dense, the molecules in closer proximity for energy transfer. Hot water or the hot surface of a stove will transfer radiant (infrared) heat to floors, walls, furniture, even people far more effectively than trying to heat comparatively far less dense air (as with a furnace). This is why it feels so good to walk into a room heated by a wood burning stove vs a central air furnace. • Central air is not a good thing. Central air is a terrible, dirty, disgusting, bad for allergies, bad for the pocket book excuse for developers to use words like “simple” and “intelligent”, making the customer feel good about buying a home which offers the least efficient means of heating a home possible. • Do you need cooling? First consider ceiling fans, improved insulation, doors, window pane and frames, thermal window shades; passive cooling via opposing (top to bottom, East to West) windows; shade trees, an attic fan and/or a swamp cooler. And if you do already have but desire to improve your AC, consider all of the above anyway, as well as a heat pump which pre-cools / heats your central air by circulating a compressed liquid through closed-loop pipes which run 30-40′ into the ground. • Thermal containers do work! While not originally intended as an energy efficiency effort, it is now very evident that the addition of the porch-workshop (described above), which covers the entire west end of my house, does keep the house considerably cooler in the summer and warmer in the winter as it provides a thermal barrier to both extremes. For more information about walls and rooms providing thermal containers or barriers, you may want to read-up on double envelope houses, an invention of the mid ’70s; or consider the value of wrap-around porches and how these shaded spaces provide for cooler air drawn into interior living spaces in the summer months. • Be open to experimentation. I am now heating each room (or set of rooms) nearly independent of the others, experimenting with a radiant gas stove, recessed 220V electric space heaters (radiant coil + squirrel cage fans), and soon, a south-facing solar black-box “heat dump” for the bedroom. The later, passive heating system can be built of a steel or copper clad box with river rock or water bottles inside to absorb and retain heat by day, then radiate by night. This method of heating is being implemented by the Navajo as a completely 100% renewable, no electricity required means of heating their homes.